Taken all together, the problems with the Big Bang plus inflation theory are not tiny negligible gaps between observation and theory; they are huge chasms you could drive a cosmological coach and horses through. Inflation isn’t really a theory. Peebles calls it a scenario; it’s a general idea that lies behind dozens of models. 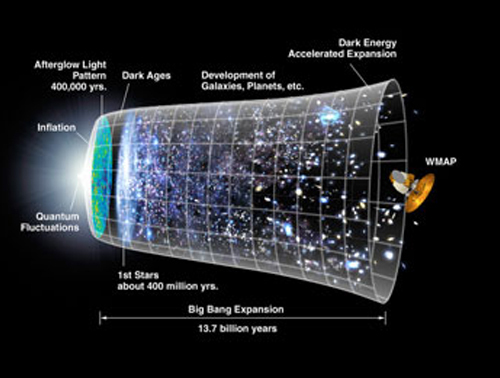 The idea is the very early universe must stretch itself far faster than light a gazikosecond after it begins. Inflation math could lose the monopoles and even out the lumps a random quantum process would have made. It could fix the horizon problem―how the universe’s temperature becomes more uniform than it has time to make it so. And it could generate a cosmos with exactly the right density. Inflationary models predicted a pattern in the Big Flash pictures. When the predicted pattern showed up nicely, inflation soon became the darling of cosmology. Yet it is outrageously unlikely. Other concepts, less unlikely than inflation, might lead to the same prediction. And inflation sweeps the problems it’s supposed to fix under a fancy new math rug. The long list of inflationary models says that physics has no clear idea what happened, how it happened, why it happened, or if any of it happened. In fact inflation is the name of yet another problem, one that tweaks the Big Bang theory to fit new facts. So inflation is high fashion in the physics world these days. But it isn’t clear what it is and the latest word is that it doesn’t work.